Madrid has some lovely parks and gardens both in the city center and in the suburbs. Here is a guide to our favourite parks in Madrid. Campo del Moro: These form part of the the gardens belonging to the Palacio Real togehter with the palace's own gardens and the 'Jardines de Atenas'. They are located on the banks of the Manzanares river. Dehesa de la Villa: Located to the north of the university campus. It is an area where the inhabitants of Madrid can have a relaxing stroll. Montes del Pardo: Located on the Monte del Pardo 15 kms from Madrid on the road to la Coruña. The hill covers 16,000 hectares and is a national park. its plants and flowers are typical to the Mediterranean. The Palacio del Pardo, the Palacio de la Zarzuela (official residence to the Spanish Royal family) and the Palacio de la Quinta are all located on this hill. The Fuente del Berro Park: c/ Jorge Juan (al final). These consist of some very old, pretty gardens, Carlos V, Felipe II and Isabel II...used to take a stroll in them and drink from the fountain (Fuente del Berro), whose waters were said to be very beneficial. It is located next to the M-30. Parque del Capricho: Avda. de Logroño on the Alameda de Osuna. These gardens belong to the Dukes of Osuna and date back to the 18th century. They are very pretty and you can see the palace, a temple dedicated to the god Baco, the jetty and the pavillion. They have been considered as special historic gardens since 1942 and won a prize 'Europa Nostra' in 2002. Parque del Oeste: Pº Pintor Rosales. Also known as the Parque de Rosales. This terrain was bought by Felipe II with the intention of joining the Monte del Pardo with the Palacio Real. It was designed by Cecilio Rodríguez and has many different kinds of roses. Parque del Retiro: c/ Alcalá/Pº del Prado. Located between la Puerta de Alcalá and the Prado Museum. Built by Felipe IV in the 17th century. There was also a palace on this site although now the only parts of the palace that remain are the Casón del Buen Retiro and the Salón de Reinos, (now the Military museum). Until 1869 the park was used exculsively by the Royal family. The park has many different types of trees although the Madroño tree which is typical to Madrid stands out. There are also several buildings in the park: the Palacio de Cristal and the Palacio de Velazquez designed by Ricardo Velazquez Bosco; the Observatory and the Casita del Pescador (built by Fernando VII). 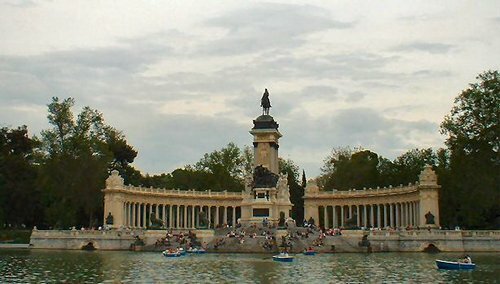 This park is a meeting place for many of Madrid's inhabitants who enjoy strolling around, riding their bikes, skating, sunbathing or rowing on the lake. You also get street theatre, buskers...etc. There is a book fair twice a year in May and in September. Parque Juan Carlos I: M-40 next to the tradefair centre. Located in a former olive grove. It has a large lake, fountains, hundreds of years old olive trees, a golf course and a lot of vegetation. At present it lacks shade but this should improve in the future when the newly planted trees have grown bigger. Parque Tierno Galván:c/ Mendez Alvaro. Next to the M-30 and near the Atocha station. This is one of the few green areas to the south of Madrid. There is a planetarium and a Museum (the Museo Angel Nieto). Real Jardín Botánico: in the Plaza Murillo, 2. Located next to the Prado Museum. Built by Carlos III in 1781. It has a large number of plants and trees from the Philippines and South America. Jardines del Descubrimiento: Located on the Paseo de Recoletos between calle Goya, Calle Jorge Juan and calle Serrano, in the middle of the commercial area. It is next to the National Library and the Archeological Museum. An ideal place to relax in the middle of the city. Casa de Campo: 1700 hectares of mediterranean forest, just a few kilomteres from the Plaza de España and old Madrid (see Palacio Real). Built by Felipe II, to be his hunting grounds. At present it includes Madrid's Zoo, Waterpark and Fair.